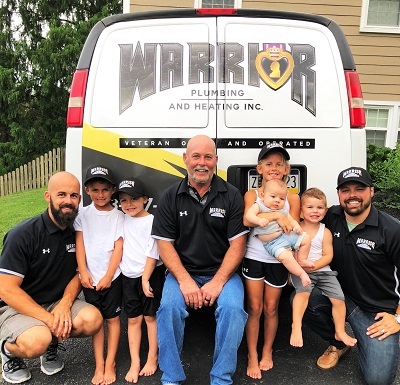 Welcome to Warrior Plumbing & Heating! Baltimore’s trusted and honest plumbing company. We are a local family-owned and operated business serving the greater Baltimore area. We are also 5th generation plumbers (and as you can see in the photo, soon to be 6th!). Honesty and integrity are just as important to us as our professional high-quality plumbing and heating services. Our goal is that you feel taken care of from your first conversation with our receptionist to when our crews finish the job and say goodbye. Our new program providing free plumbing and heating services to Baltimore veterans in need. Being a local Baltimore company and strive to serve each of our customers like they are family. We offer great prices and services. We don’t set a limit on our availability to serve you—we are available 24/7 for those plumbing and heating emergencies! This is why we offer our services to so many areas in Baltimore because we want everyone to enjoy the benefit of our high-quality plumbing and heating! It would be selfish to keep it to ourselves. Recieve our newsletters in your email every month. We won’t send you any ‘Junk’ and we will NEVER provide your email address to any other company for any reason EVER!